Perhaps the most remarkable aspect of this collage is what you can&apos;t see. There were no Mercury gauges or displays whatsoever on this Navico demo boat thanks to a new Mercury black box called the VesselView Link that offers complete gauge and control integration. 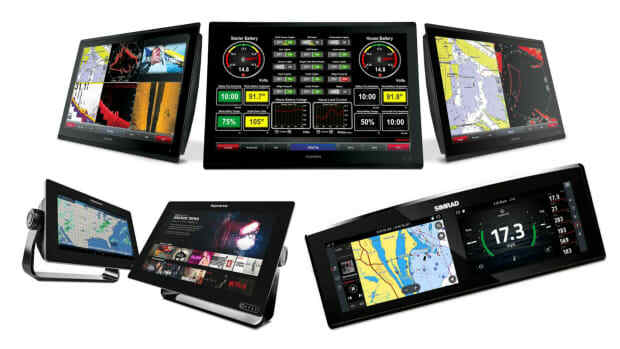 Simrad and Lowrance VesselView engine interfaces have also been vastly improved, and Mercury is offering similar full MFD integration on its own new VesselView 702 and 502 displays. 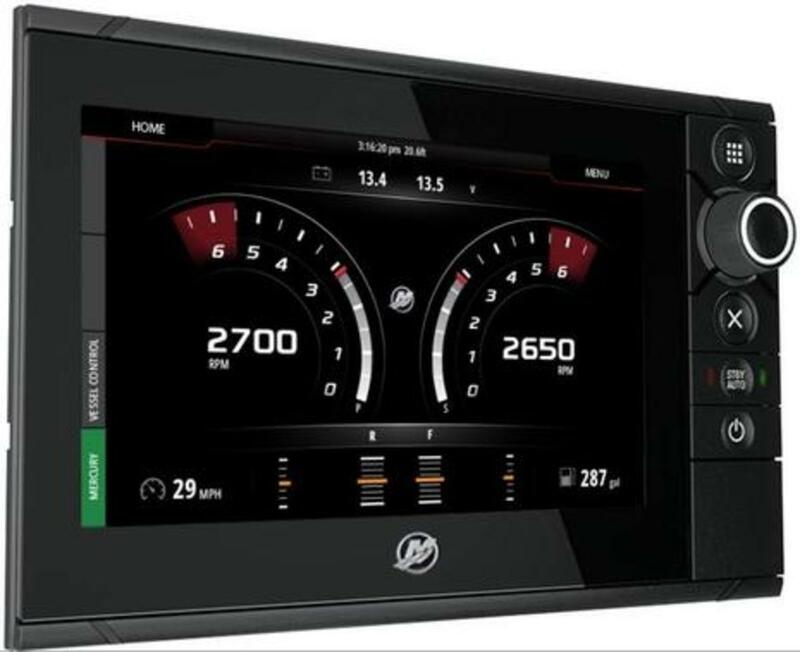 So a clean single-brand helm electronics setup is now available under three different brands, and seems reasonably priced even for a relatively small boat. Plus, Mercury offers several other rigging choices including basic NMEA 2000 gauge data output to any brand MFD. Explaining all the possibilities is harder than using them, but let&apos;s give it a try. Actually, a little history is in order, like how Mercury and Navico&apos;s relationship predates the Navico brand as we know it! Mercury&apos;s powerful though proprietary SmartCraft networking system was first developed by Brunswick&apos;s New Technologies group (BNT) which included Northstar, and thus Panbo discussed Mercury MFD gauge integration in 2005. 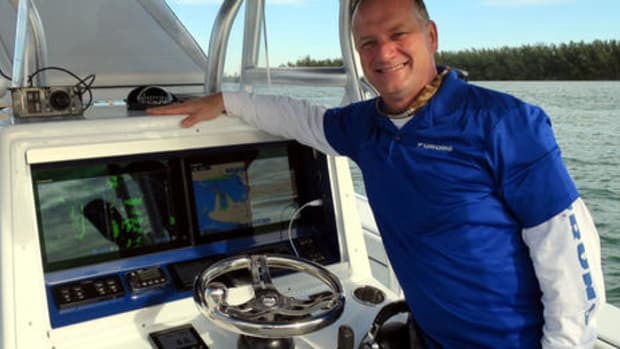 But then Navico was created from the merger of Simrad and Lowrance in 2006, and it acquired BNT&apos;s marine electronics assets shortly thereafter. Some of the brands like Northstar and Navman got cut as Navico rationalized its product lines, but at least some of the engineers with SmartCraft integration skills apparently stuck around. Jumping ahead to 2014, here&apos;s a Simrad NSS12 and a Mercury VesselView 7 showing some tight glass-bridge-style integration at the Miami show. Yes, as that entry noted, Navico built the VesselView 7 (and the 4-inch model) to Mercury&apos;s specification, each with a SmartCraft port on the back and an internal gateway to NMEA 2000. That (and Ethernet for sharing charts, etc.) is why the MFD can show VesselView engine screens while the VesselView itself can act as a fairly full-featured MFD. 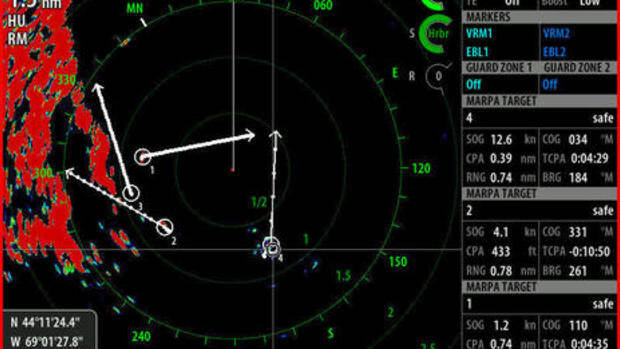 It seems like a useful integration, but you still need to have both VesselView and Simrad displays on the boat, and that&apos;s what&apos;s about to change in multiple ways, thanks to the new VesselView Link, 702 and 502 products detailed below. 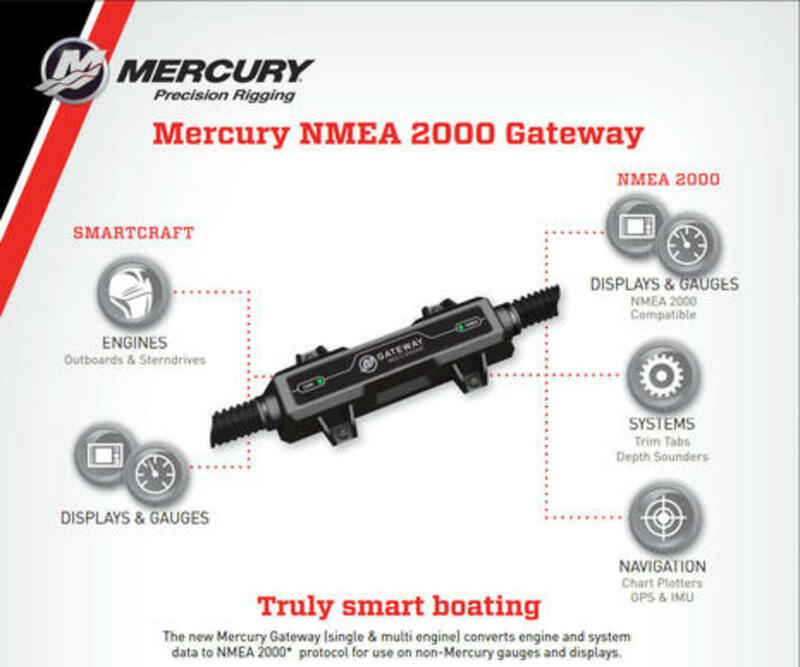 First, though, let&apos;s review what Mercury can do with standard NMEA 2000. 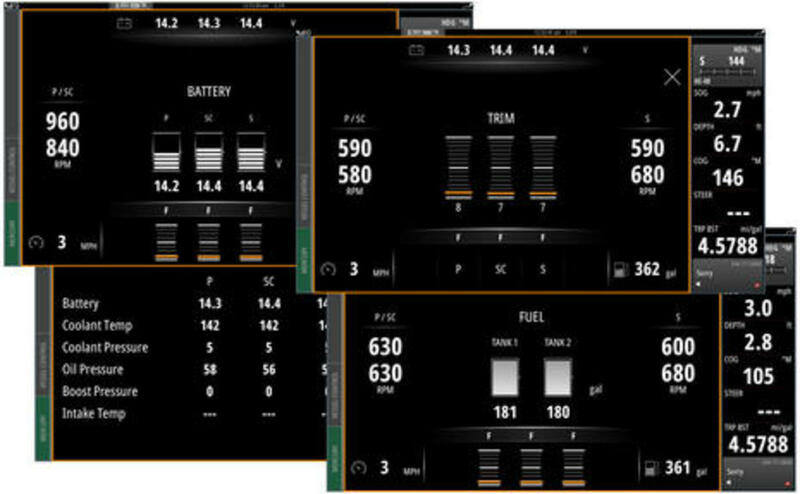 When the MercMonitor came out in 2009, one noteworthy feature was an included gateway to any N2K MFD or instrument display that understands PGNs (Protocol Group Numbers) for RPM, oil pressure, etc. So you can use the Monitor mainly to control SmartCraft features like Troll Control, while the gauge data shows on a bigger, more colorful screen (perhaps with advanced gauge designs and alarming). MercMonitor is still available, and at the bottom of its page you&apos;ll find a link to the standalone N2K gateway above (PDF here). Note, though, that the separate single and multi-engine gateways have been superceded by one model (part # 8M0105243) as shown on this third-party Verado site. 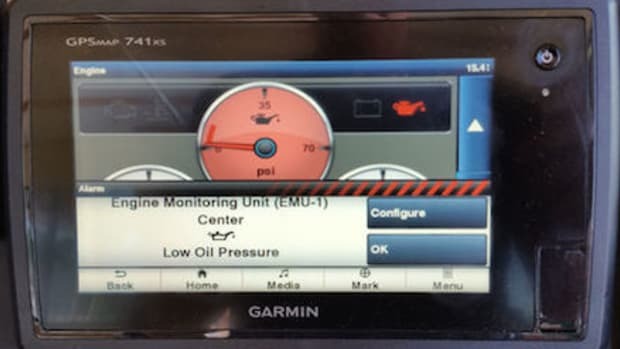 While the NMEA 2000 standard does include common engine control commands, engine manufacturers have avoided them, which seems understandable given the technical and liability issues involved. Standard N2K engine commands probably don&apos;t include nuances like SmartCraft Smart Tow either. 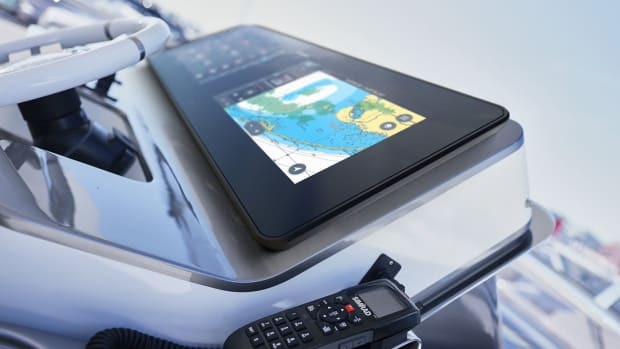 So what we&apos;ve seen is partnerships like the Volvo Penta (Garmin) Glass Cockpit, which still use N2K but network critical commands (and deep info-like fault messages) using proprietary PGNs. Now let&apos;s see how the Mercury Navico integrations have evolved. 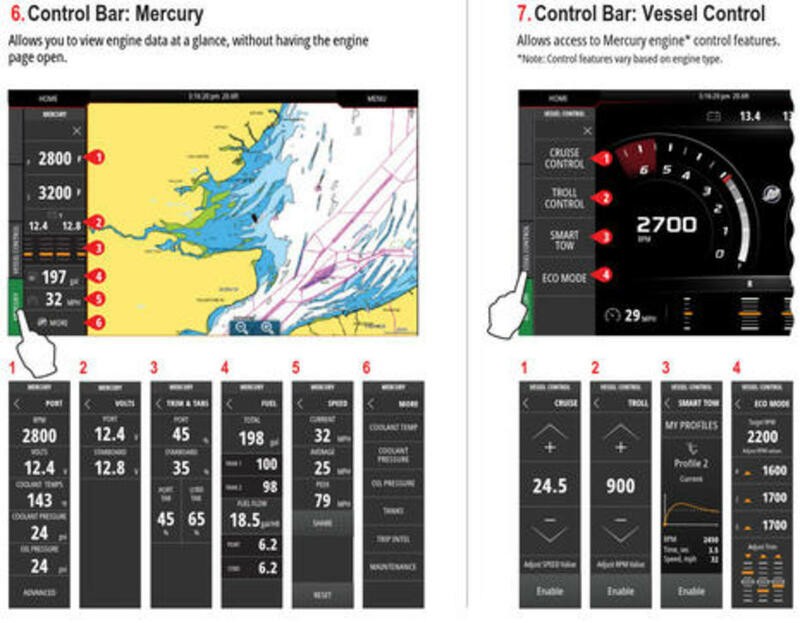 Until now boaters with Mercury Smartcraft engines needed a SmartCraft gauge or display to get full data and control functionality from their (40HP and up) outboard, sterndrive or inboard. 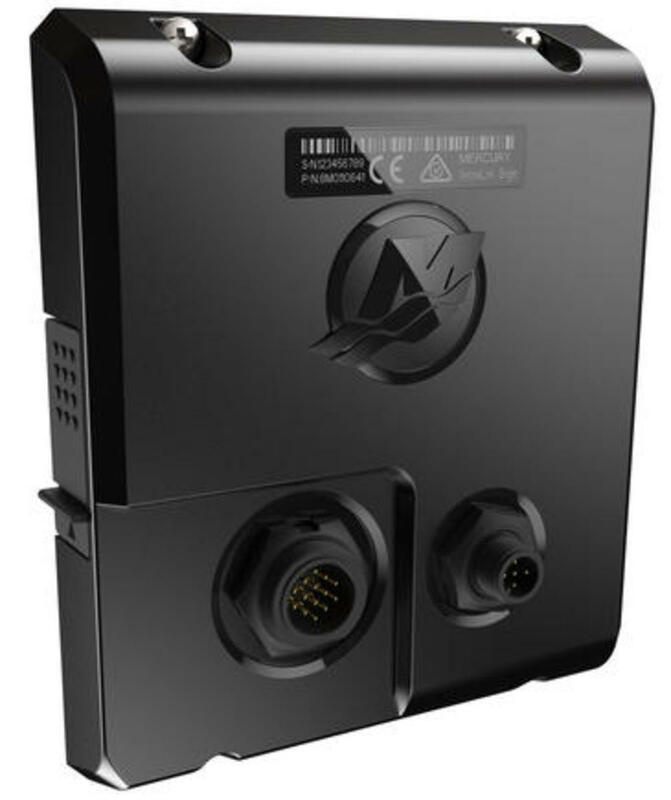 Shipping in June, VesselView Link is a complete Smartcraft to N2K engine gateway that enables a complete engine interface on certain Simrad and Lowrance MFDs (and also on the new Mercury 702/502 VesselView displays). 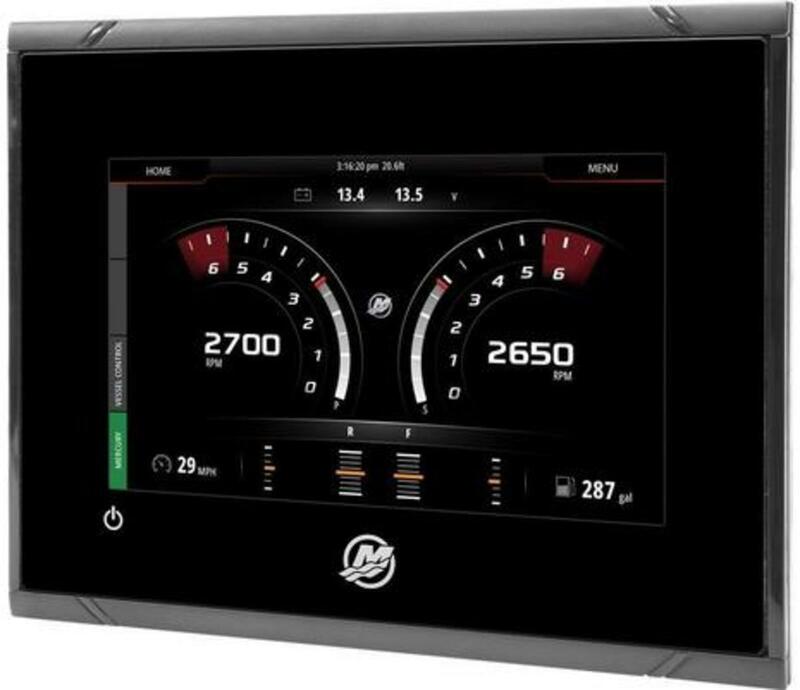 Boatbuilders can free up valuable dashboard real estate with either the VV Link single engine (#8M0110639) retailing for $615 or the multi-engine version (#8M0110641) for $1200. 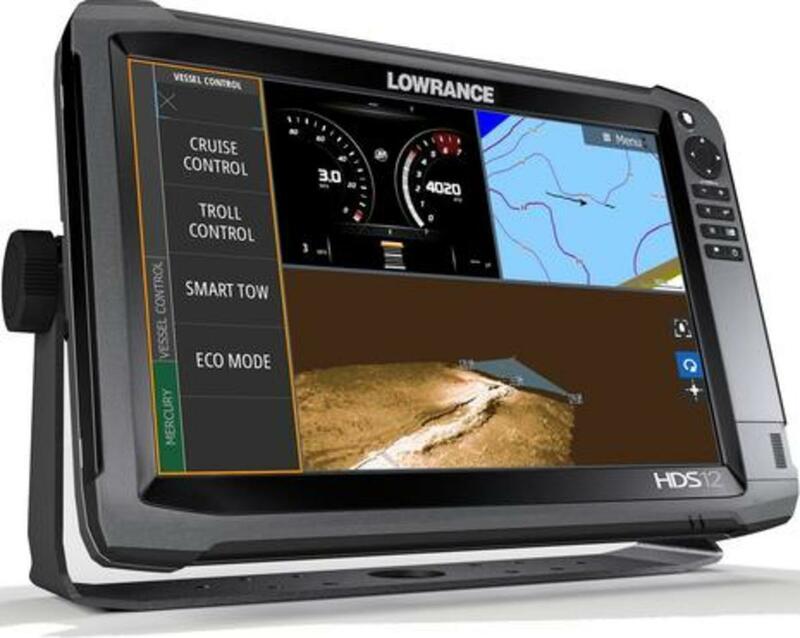 That means a single outboard boat with a single Lowrance HDS-7m Gen2 Touch will have glass-cockpit-style engine monitoring and management for about $1,314 retail (not including boat and motor). 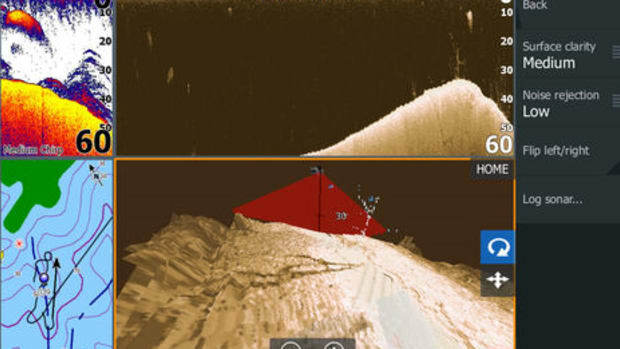 Here&apos;s a Lowrance HDS 12 Gen3 showing some of the new VesselView Link engine interface features that will be included in Lowrance and Simrad software updates purportedly coming in June. Note that you can now show the gauges in a window, not just full screen as used to be the case with the V7/V4 integration. We have more about the improved interface further down the entry. What I&apos;m most excited about is the ability to easily distribute these software updates (which we release about twice a year, to include new features, functions and any bug fixes) and also the ability to offer advanced features for Mercury propulsion systems as DLC (downloadable content) from the GoFree store. We have the potential to offer an upgraded or advanced feature to a wide range of users. That&apos;s just cool! What&apos;s the takeaway so far? 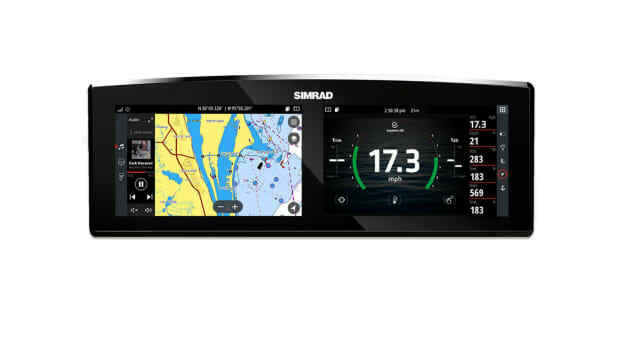 SmartCraft descriptive fault codes, comprehensive engine data and digital propulsion control features such as Cruise Control, Smart Tow, Eco Mode and Troll Control (in 10 RPM increments) will soon be available on Mercury, Lowrance, or Simrad MFDs without other helm gauges or displays at a lower total cost than previous options. 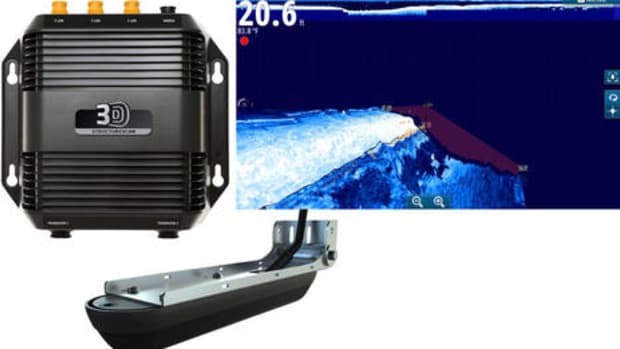 Why use Mercury MFDs instead of Simrad or Lowrance? That might be the choice of a boatbuilder wanting engine and electronics all one brand, or a big boat that wants VesselView as a full featured engine display with navigation backup capabilities. 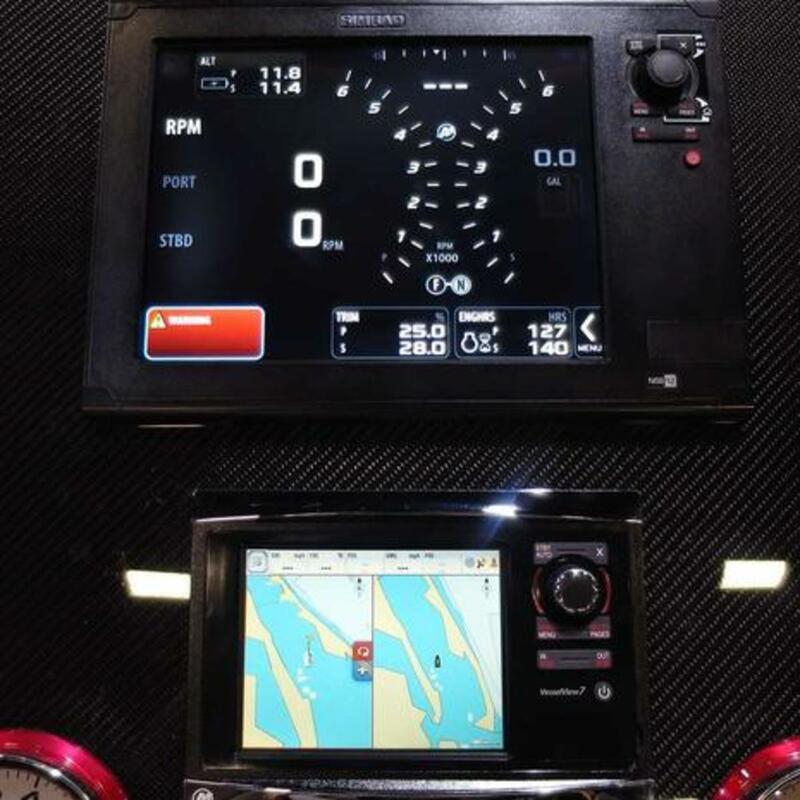 The new VesselView interface -- seen working splitscreen above with four SmartCraft outboards -- seems to be very similar on all the Simrad, Lowrance, and Mercury displays where it will run. 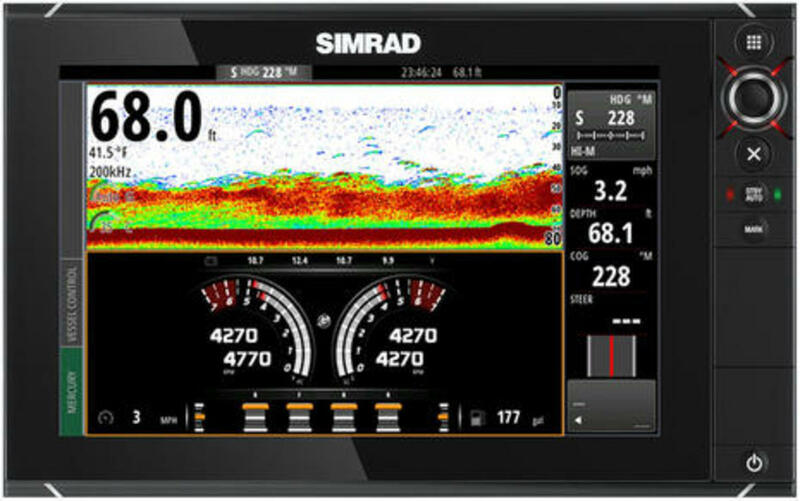 Simrad VV Link models are here with other details and similar Lowrance VVL specifics are here. One feature of the new interface is quick access to numerous popup info screens simply by tapping on the main guage window. If you want more detail on engine trim, for instance, you just tap on the trim icons seen at the bottom of the main engine window. It&apos;s easy to remember! Note that these screens were taken during the Navico writers event in January (also seen in the top image) and the video below was shot on the same triple-engine boat. TheSimard VVL video nicely shows how VesselView can be added to a multi-window screen layout and also the Quick Access Bar that can always be available regardless of the screen layout (which is also seen on all the screens above). Tapping "Mercury" gets you a narrow but informative engine data sidebar and tapping "Vessel Control" gets you to Smart Tow, Eco Mode, etc. all nicely illustrated in the Mercury VesselView 702 quick guide snip below. The user can adjust the engine parameter limits, though, and that adjusts the scaling of the data that gets displayed (and what you may consider "red" before the alarm goes off). I monitor seawater pump pressure (aka coolant pressure). I know what that nominal value is when I&apos;m at idle and at every 1000 RPM increment. When it drops off more than 10%, I change the seawater pump impeller. 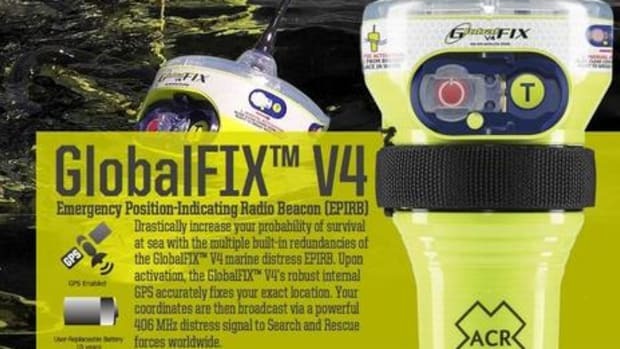 At any rate, Walter&apos;s enthusiasm about all the ways Mercury and Navico are now working together seems completely justified, and we suspect it will spread into the boating world rapidly once all these products become available.